Betting On Fear In A Volatile Stock Market The Volatility Index — or VIX — was created in 1992 to measure market nervousness, and even trade on it. And with the stock market logging huge single-day gains and losses, the volume of VIX-related trades hit record highs this month. A trader studies his computer screen in the VIX pit at the Chicago Board Options Exchange on April 27. If being invested in a wildly unpredictable stock market freaks you out right now, you're definitely not alone. In fact, there's an index to measure that nervousness, and even trade on it. 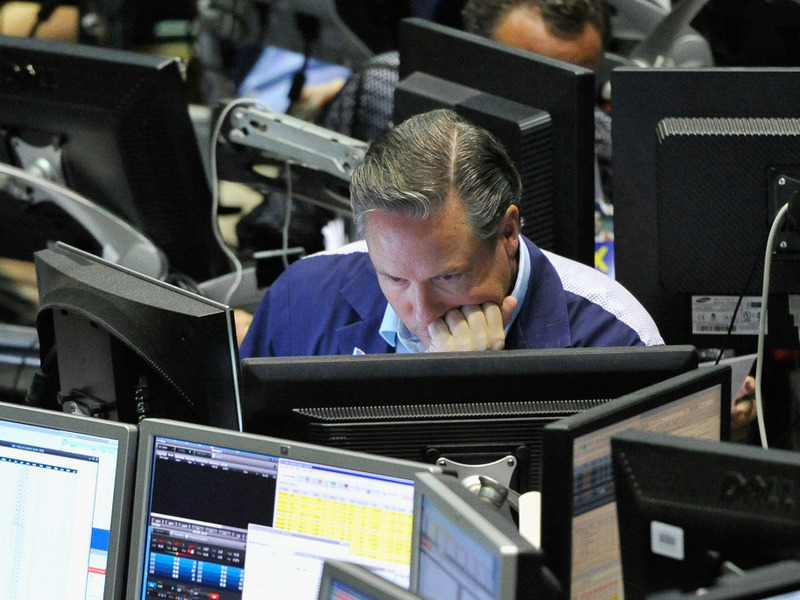 It's called the Volatility Index, or VIX, but it also goes by another name: the fear gauge. And during times like these, the VIX draws a lot of attention. In 1992 in Burgundy, France, Vanderbilt professor Robert Whaley was on sabbatical. He had bought a house in the town of Aunay-en-Bazois — an idyllic setting to devise something called the fear gauge. He brought two computers with a lot of horsepower, and he fed them a bunch of numbers dating back to 1986 in order to find a mathematical formula that could isolate and predict volatility. "VIX gives you a notion of how uncertain the market is," he says. Most economic data, like unemployment and GDP growth, are backward-looking. The VIX gives traders something different, because it's based on prices of contracts to buy stocks in the future. Whaley compares VIX to insurance: If there's a hurricane brewing, homeowners in its path are willing to pay more for home insurance, so the price for insurance goes up. VIX works the same way. "The market's becoming nervous that the value of their stock portfolios are going to fall, so they go rush out and buy portfolio insurance," Whaley says. That's why a higher VIX tends to gauge market fear. During a normal, ho-hum kind of trading day, the VIX is about 17. During the stock market crash of October 1987, the VIX — had it existed — would have hit 117. And Aug. 8, the first trading day after the U.S. lost its top credit rating, the VIX reached 48. There are a host of ways to bet on the VIX. In fact, it was developed for that purpose at the behest of the Chicago Board Options Exchange. The VIX is based on the Standard & Poor's 500 index. There are similar measures based on gold and oil, as well as the Dow, the Nasdaq and other stock indices around the world. Ben Londergan is chief executive of Group One, a firm that facilitates the buying and selling of VIX options. He spends his days in the trading pit of the Chicago options exchange, an especially chaotic place these days. "Thirty people are screaming at one guy, 30 people are screaming at another guy," he says. With the stock market logging huge single-day gains and losses, the volume of VIX-related trades hit record highs this month. "This is going to sound pathetic, but it's physically exhausting. I mean, it's mentally, extremely draining," he says. Londergan says market crashes are good for his business, but personally, it's not fun to profit off of fear. "As the markets are imploding and you see lots of negative things happening, you tend to have perhaps a professional victory that is very, very bittersweet," Londergan says. Whaley, the professor who developed VIX in the first place, says he uses it to evaluate his own trades. If the VIX is high, he's less likely to act on specific company stocks. Whaley recently bet volatility was going to go up, but he was two months too early and didn't make any money. But that's OK, he says. Hearing other people discuss the fear gauge he developed is a thrill all its own. Volatility Index closing numbers from Jan. 3, 2006, to Aug. 11, 2011.